Visible crew/equipment: In the very first scene when the camera pans in to the butcher shop, you can clearly see the shadow of the cameraman on the lift. Continuity mistake: At the Stardust Ballroom, listen to the first song the dance band is playing on the soundtrack. It skips measures and at one point is hastily spliced to begin again so as to continue because more time is needed in the scene. 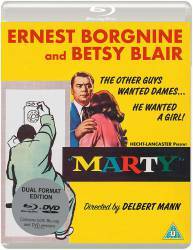 The MGM DVD copy is incomplete because it is missing the scene in which Clara speaks with her parents after her evening with Marty. The scene is present on the CBS/Fox VHS. Continuity mistake: When Caterina sits in the chair while talking to Marty's mother, from one angle her hands are to her sides near the arms of the chair, but from another angle they're folded in her lap. Continuity mistake: In the first scene at the butcher shop, from one angle Marty has finished cutting the meat and his arms are down. But when it cuts to another angle, he's still cutting the meat. Marty Pilletti: I've been looking for a girl every Saturday night of my life. Writer Paddy Chayefsky has a cameo as "Leo", who appears in the back of the car when Marty is approached by his friends.